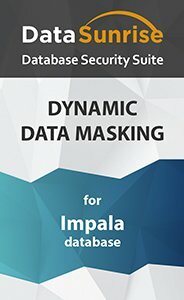 Impala Data Masking from DataSunrise is a tool specifically designed to protect sensitive data in Impala databases from all kinds of inside and outside threats. This is achieved through obfuscation of original data. Instead unauthorized users get a set of random characters and have no access to real database records. In the result the production database can still be used to work with, for example when access to the database is needed for third-parties but real sensitive data remains hidden. In practice there can be many cases when companies have to provide access to their production database to third parties. When you use Impala Data Masking by DataSunrise you can replace sensitive data with random or predefined values. That makes the original data inaccessible for nor-authorized or unwanted users. So, if needed, databases with sensitive data can be exposed to third parties for example for the purpose of application development, testing, analysis, etc., without really exposing data. Intentional and unintentional data leaks coming from within the company can also be eliminated by limiting data exposure to company employees. Impala Data Masking algorithms make obfuscated data look real, but it’s absolutely useless for any potential wrongdoer. With DataSunrise you can have static and dynamic Impala Data Masking. If we speak about static Data Masking then a copy of real database is created. This copy contains just obfuscated data, real data remains intact and unexposed. If we speak about dynamic Impala Data Masking then data obfuscation is done on-the-fly at the moment of a query to the database. And again, what any unauthorized query gets is just neutral or randomized data. Impala Data Masking tool hides database entries according to the masking Rules set by database owners or admins. You can use this tool to obfuscate more than 20 types of sensitive and user-related information including but not limited to emails, credit card numbers, dates, addresses, etc. Masking Rules are highly adjustable to make sure that meet any of our customer’s requirements.